It was 2011, in the month of June. I was back in the village of Walberswick, Suffolk, UK for a visit after more than a three decades long absence. Of course, I went down to the beach. It was a windy day and even though the sun was out, nothing glinted the warm bright orange color of carnelians up to me from the pebble beach. I sauntered along thinking of my father, my siblings, my mother–all the things we did and did not do–during so many Walberswick days of my childhood. I picked up a few shells and put them in my pockets. Bending way down to the sand, I did find a grey stone with a gray heart rimmed with white. Second-best perfect, I thought! I kept this one in the palm of my hand, enjoying the smooth raised heart. During my stay in Walberswick, Tassie, the daughter of our family’s village friends, whisked me off in her car to visit her mother Diana, this beautiful warm woman my whole family loved. Tassie’s father Clifford, Diana’s husband, also a most beloved family friend, was no longer alive. Tassie brought out artist Clifford’s’ paintings to show them to me. Oh what lovely landscapes he had done of Walberswick! While I studied them, I could still see him hard at work when I used to come upon him in the village. My chest heaved with the wistful memory. Tassie didn’t stop there. While we sat on the back patio, she brought out her family’s collection of carnelians on a gray stone tray. If I didn’t gasp out loud, I am sure I laughed with delight, or at least smiled broadly. Diana held the tray out to me. I lifted a beauty from it and lay it on top of my knee. It was not wet, very dry in fact. But, still utterly amazing. Beautiful! Yes, I wished I could take it home. No luck there. It’s part of this family’s magnificent collection. A family heirloom. It was an ordinary day in November in the year 2015. I went to the mailbox to fetch the usual things I don’t want—advertisements, bills etc., but in the pile I spotted something unusual: an air mail envelope from the UK with a customs declaration on the front that also had a gift box checked and a description underneath that stated it was costume jewellery. What’s this? I opened it up at once. Inside was a valentine! My heart danced a jig. My good childhood friend Ann, originally from the village of Walberswick, Suffolk, UK, went to the beach and collected carnelians for me! What a thoughtful thing to do! “Squinting through Carnelians” is now a part of the book Jewels That Speak: Tiffanys, Freuds, and Me to be published on April 17th, 10 days from now. And here are the carnelians three years later. Ann’s carnelians from the beach in Walberswick, Suffolk UK, in a pink pottery bowl from my daughter, Cora, and with a sage leaf from my son, Roland. Where did I leave off? Staring at my last blog on the computer screen right now, I see it was February 15th. Forty-nine days ago, and the eBook is still not where I would like it to be! Almost, but not quite. It became so frustrating that I had to change eBook publishers and this one is better, but there have still been many issues perhaps because the original file was done in an InDesign file format for the print book to make it attractive to the eye and because it includes photos and graphics and InDesign does not readily convert to mobi–which is what you need for Kindle devices. The epub file needed for Apple devices, like iBooks, also had conversion problems from the original InDesign file. There have been entirely too many files to count! Last night I carefully studied the new file I had just been sent on Kindle previewer in KDP (Amazon Direct Kindle Publishing) in font size 4 (it goes 1-9). I read the whole book through. Even though I know the book so well, it took hours to do the examination. I prayed that my eyes would be copyeditors’ eyes, instead of the ordinary eyes I possess. I found only a few things (4 exactly) that can easily be fixed. Big, big, sigh of relief! We just might make the deadline, which for a publication date of April 17th must be April 13th on KDP. I receive Nathan Bransford’s blogs in my inbox. He’s been very good lately with his media tips for getting the word out about your books as well as his concentration for author writing tips. There’s tip-meat there to chew on if you are an organized person, and if you’re not, if you make yourself be organized with what he calls “extreme calendering” (his spelling.) He said he would probably have a future blog about this in more detail. I was already doing his suggestion. Yay! How? By writing down every single thing I do for my book Jewels That Speak: Tiffanys, Freuds, and Me, its date and its time in a calendar notebook. I head to my study about 5:30 am, sometimes 6:30 am, and stay there working for hours until I notice a slump in energy and know it is time for some food sustenance. Following Nathan Bransford’s tip of last night, I have my computer on full-screen mode, my phone is put away, and I have a sticky note on the top right of my screen that blocks out any incoming emails from floating across my screen. (Next step is doing the blocking on the computer itself. Oh dear!). Concentration seems to be working though! Yay again! Thanks, Nathan! Now, for something beautiful, peaceful, and relaxing about spring that I love. Spring flowering daffodils are symbols of rebirth and often called Lent lilies. 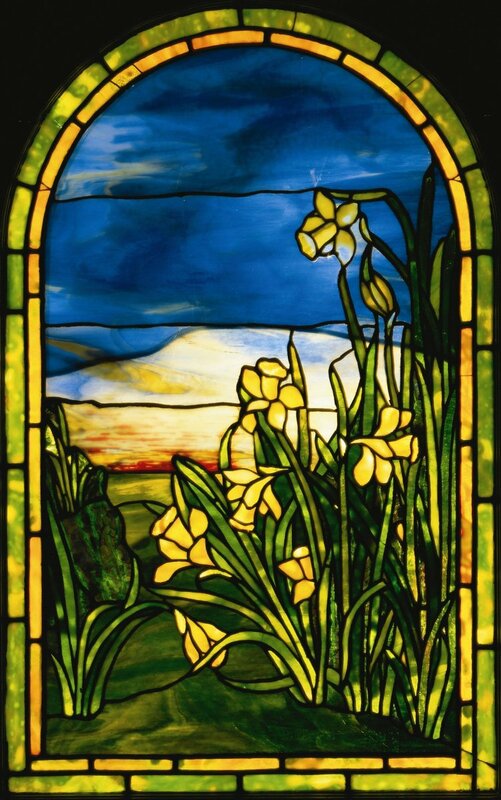 This leaded-glass window, c. 1916, from the Morse collection is by Tiffany Studios.